What are you doing on your leap year day? Well, I took a day off of work to wait on a plumber, get therapy set up (knees), and work on taxes, ugh. But I really want to sew, so it will take lots of discipline to do right and get these things done. Before I was going to start on the list, I read my favorite blogs. (Celeste that sounds like Tahoe) and there is a give away on two of my favorite quilt blogs today. Bonnie Hunter, and Pat Sloan are giving away some cool stuff. So go to the links and leave comments and follow the rest of the deal...just takes a minute. Bonnie Hunter is changing how I think about my stash. Have a great "extra" day! On to the list! Yesterday I was supposed to go take a tennis lesson, but after a hard day at work, I just sat on the couch and fell asleep. I got up at 6:45 and went upstairs to sew, but was falling asleep at the sewing machine, so I caved and went to bed at 7:30. Slept till 4:30 this morning, so I must have needed it. So today I am going to show a minor renovation I made in my sewing room. I built a shelf and cut a hole in the counter so the bed of the machine sits level with the counter. I got the hole a little too wide, but overall I am very happy. Then the bolt heads were causing the fabric to get caught up so I borrowed my brother Jeff's router and routed out an area for them so that would be level too. I obviously need some practice with the router, but it is ok for what it is. Another unintended benefit is that the cords now run under the counter instead of over it :-). view of the shelf from under side. I think Mona should be holding a ticket to see Elvis and wearing an Elvis necklace. Our guild is participating in the ultimate guild challenge. Our challenge is to create a 36 x 36 inch quilt that portrays an Elvis song. I chose the song Mona Lisa. I decided the middle of the quilt would be a pixilation of the famous painting with raw edge applique for the eyes, lips and hands. The sides will have pictures that relate to images in the song. The cut pieces are 1 1/2 inches and will sew together to be 1 inch...hopefully. I had to miss the Friday night portion of the gathering, but I understand the kids from Mississippi School of the Arts did a great job. I did get to go to the go to Saturday session and it was wonderful. 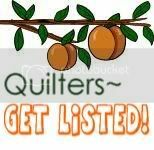 First we had a lot of announcements of quilt shows around the state. There are a lot coming up. Then Rhonda Burlingame was sick so another member got up and did the program on fussy cutting. She showed some quilts using a technique she call fractured quilting. Isn't that a cool look? I am not sure I want to do that, but it is seriously cool. Showing members pictures of her quilts on her ipad. Next Diane Williams, a storyteller and art quilter, came and told us a story and told us about her quilting journey. Next up was a bed turning. They had asked people to bring antique quilts. I brought 2 quilts that my grandmother, Frances Turnage had made and 4 quilts that my great grandmother, Connie Billingsley, on my mother's side had made. They were a big hit. After a nice lunch they had Joan Alliston did a program on Dear Jane quilts. These are made with 4.5 inch blocks....I feel them calling my name...but I must resist till I get some things off of my plate. Finally, my dear friend, Judy, wearing the print jacket, was installed as president. She will do a great job. and of course there was great shopping. Love our quilt show vendors! I need to come up with a plan. The day is quickly slipping away. I keep working on projects, but it seems like I am not getting enough done. I finished sewing some blocks for a quilt for my senior. I worked on some other blocks for a quilt for a special friend. I cleaned the kitchen and worked on Mona, but I need to do a number of other things. Papers need to be graded and lesson plans done, also need to go the grocery store and do a few other things. Well I guess I better get to the other things on the list. I am starting a new blog. About a year, or more, ago I set up a blog. I was going to use it for my classes, but then let it go...where has the time gone? So now I have decided to try again. I was stuck on what to call it. The title is not as catchy as I would like it to be. But maybe that is reflective of me. I am not a real flashy type. I want to use this blog to share thoughts and feelings about the progress in certain areas of my life. Hope you enjoy following along with me.